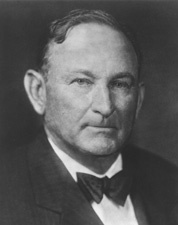 ROBINSON, Joseph Taylor, a Representative and a Senator from Arkansas; born on a farm near Lonoke, Lonoke County, Ark., August 26, 1872; attended the common schools, the University of Arkansas at Fayetteville, and the law department of the University of Virginia at Charlottesville; admitted to the bar in 1895 and commenced practice in Lonoke, Ark. ; member, State general assembly 1895; presidential elector on the Democratic ticket in 1900; elected as a Democrat to the Fifty-eighth and to the four succeeding Congresses and served from March 4, 1903, to January 14, 1913, when he resigned, having been elected Governor; chairman, Committee on Public Lands (Sixty-second Congress); Governor of Arkansas from January 16 to March 8, 1913, when he resigned, having been elected Senator; elected to the United States Senate in 1913 to fill the seat vacated by the death of Senator Jeff Davis; reelected in 1918, 1924, 1930 and 1936 and served from March 10, 1913, until his death; minority leader and Democratic caucus chairman 1923-1933; majority leader and Democratic caucus chairman 1933-1937; chairman, Committee on Expenditures in the Treasury Department (Sixty-third and Sixty-fourth Congresses), Committee on Claims (Sixty-fifth Congress); unsuccessful candidate for Vice President of the United States on the Democratic ticket in 1928; died in Washington, D.C., July 14, 1937; funeral services were held in the Chamber of the United States Senate; interment in Roselawn Memorial Park in Little Rock, Ark. Papers: Correspondence in American Association for Labor Legislation records, 1915-1920, on 9 microfilm reels. Papers: 1900-1954. 216 feet. Correspondence, memoranda, speeches, legislative bills, business and financial records, legal files, scrapbooks, clippings, photographs, and other papers relating to his life and professional, political and governmental careers, including work as U.S. Senate minority and majority leader and Democratic candidate for vice president in 1928. Finding aid. Additional Papers: Correspondence in Arthur Brann Caldwell papers, 1912-1975. Finding aid. Papers: Letter in Committee on Foreign Relations correspondence with Theodore Dreiser, 1934. Bacon, Donald C. "Joseph Taylor Robinson: The Good Soldier." In First Among Equals: Outstanding Senate Leaders of the Twentieth Century, edited by Richard A. Baker and Roger H. Davidson, pp. 63-97. Washington: Congressional Quarterly, 1991. Carson, Jamie L., and Benjamin A. Kleinerman. "A Switch in Time Saves Nine: Institutions, Strategic Actors, and FDR's Court-packing Plan." Public Choice 113 (December 2002): 301-324. Chiles, John E. "The Early Public Career of Joseph Taylor Robinson." Master's thesis, Vanderbilt University, 1950. Grant, Gilbert Richard. "Joseph Taylor Robinson in Foreign Affairs." Arkansas Historical Quarterly 9 (Autumn 1950): 133-71. Ledbetter, Cal, Jr. "Joe T. Robinson and the Presidential Campaign of 1928." Arkansas Historical Quarterly 45 (Summer 1986): 95-125. ___. "The Special Senatorial Election of 1937 and Its Legacy for Arkansas Politics." Arkansas Historical Quarterly 63 (Spring 2004): 1-23. Neal, Nevin Emil. "A Biography of Joseph T. Robinson." Ph.D. dissertation, University of Oklahoma, 1958. Petersen, Svend. "Arkansas' Favorite Son." Arkansas Historical Quarterly 3 (Summer 1944): 137-46. Rhodes, Dennis Harrison. "The Political Speaking of Joseph Taylor Robinson." Ph.D. dissertation, Southern Illinois University at Carbondale, 1965. Robinson, E.R. The Heart of "The Toiler's Martyr". Little Rock: Central Printing Co., 1938. Skarda, Charles M. The Late Senator: Notes on the Life of Joe T. Robinson of Arkansas, 1872-1937. Little Rock: n.p., 1959. Towns, Stuart. "Joseph T. Robinson and Arkansas Politics: 1912-1913." Arkansas Historical Quarterly 24 (Winter 1965): 291-307. U.S. Congress. Memorial Services Held in the House of Representatives and Senate of the United States, Together with Remarks Presented in Eulogy of Joseph Taylor Robinson, Late a Senator from Arkansas. 75th Cong., 3d sess., 1938. Washington: Government Printing Office, 1938. Vervack, Jerry Jules. "The Making of a Politician: Joe T. Robinson, 1872-1921." Ph.D. dissertation, University of Arkansas, 1990. Weller, Cecil Edward, Jr. Joe T. Robinson: Always a Loyal Democrat. Fayetteville: University of Arkansas Press, 1998. ___. "Joseph Taylor Robinson: Keystone of Franklin D. Roosevelt's Supreme Court 'Packing' Plan." Southern Historian 7 (Spring 1986): 23-30. ___. "Joseph Taylor Robinson and the Robinson-Patman Act." Arkansas Historical Quarterly 47 (Spring 1988): 29-36. Williams, Nancy A., ed. Arkansas Biography: A Collection of Notable Lives. Fayetteville: University of Arkansas Press, 2000: 244-245.